The Memorial Park Trees were planted on the 29th March 1931 during the visit of the Allan Kippax X1 Cricket team to commemorate those who died in service or were killed in action during World War One. Sir Donald Bradman was a member of this team which played a match at Innisfail on the 1st April 1931. Innisfail March 29. Occasion was taken during the visit of Kippax's cricket team to Innisfail to carry out a tree planting ceremony in the Memorial Park in honor of the fallen soldiers. 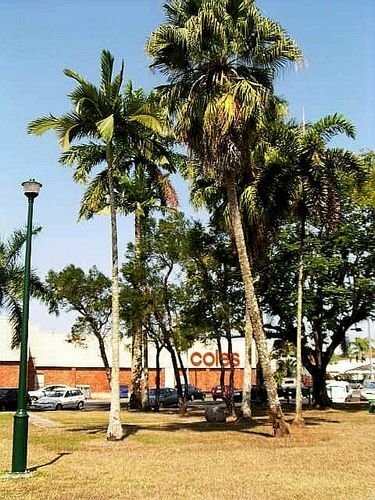 Two trees were planted near the entrance gate by Mesdames Kippax and Lynam, the latter being the wife of the president of the Innisfail District Cricket Association. Each member of the team planted a tree around the rotunda and Messrs. W. J. Morgan, A. Little and C. Wilson planted palms, whilst tree-planting also was done by Councillor. S. K. Page (chairman Johnstone Shire Council), and Mr. R.W. Moore (president the Chamber of Commerce). Cairns Post (Qld), 31 March 1931.